A woodworking machine for turning round sections. It can also be used for boring. 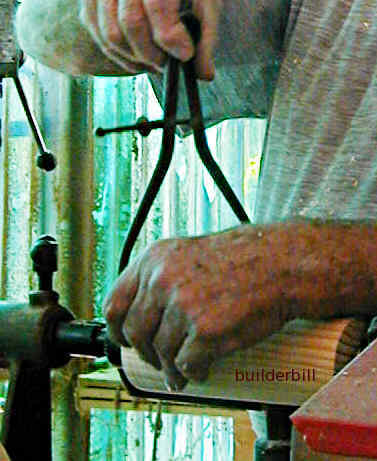 The turning tools are normally held by hand with the aid of a tool rest. 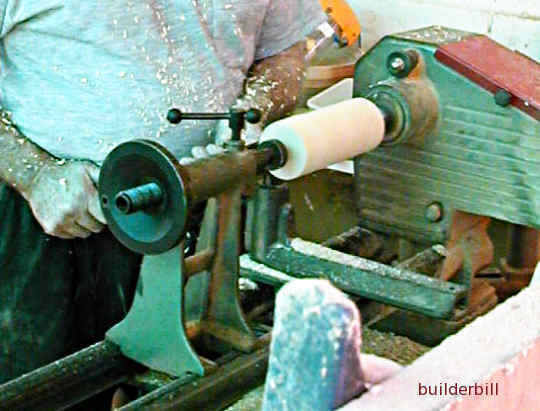 The act of shaping circular wooden sections in a lathe. A turner is person doing the work. A machinists tool for checking the size of something turned on a lathe. They can be categorised by being Inside callipers or outside callipers. Lathes for turning wood must be one of the oldest and first used machine tools. Initial they were driven by human power only, you can see an example of a foot powered one here. On this page we are looking at engine driven lathes which are almost exclusively driven by electric motors. Above, is a small electric powered wood turning lathe cutting a piece of softwood. To the right is a shot of the turner checking the outside diameter of a turning with a set of external spring callipers. This is done from time to time during the work until the correct size is reached. Internal callipers are straight, almost like a pair of compasses, except that the last part of each leg turns outwards to enable them to gauge the internal size. The size of a wood lathe is related to the size of the material that it can turn or rotate, (actual the same applies to metal lathes also). This is called The swing, so a 6" lathe is a lathe that can turn a piece of timber that has a radius of 6". The other size that defines a lathe is the length of the bed. So we can get long bed and short bed lathes with the same swing. The lathe bed is the base on which the components of the lathe are fixed. It almost always has some method of not only fixing the parts in position but of adjusting their positions to suit the length of the work being turned. It can be fixed to a bench or as in the case here it can be part of the stand with legs attached. The tailstock carries a fitting that supports the end of the work being turned. The headstock and the tailstock are centred on the same horizontal axis, except in circumstances where the tailstock is offset to create tapered work. The faceplate, not shown clearly here is on the opposite side of the main shaft to the headstock. It is used for turning bowls and the like that do not need the use of the tailstock to steady them. By placing the faceplate on the end of the machine material can be turned that is of greater radius than that which can be swung between centres. The motor is directly connected to a shaft in the gearbox. The gearbox normally has two shafts that hold a number of pulleys of varying diameters. By changing the drive belt from one set of pulleys to another different gearing ratios are selected. See the wood turning tools page for more lathe photos.